This entry was posted in Food Glorious Food and tagged apple and oat muffins, apples, australia, easy, fruit, quick, raw sugar, recipes, seasonal, slow food by cityhippyfarmgirl. Bookmark the permalink. I had one of those sneaky naps yesterday evening and was awoken by little angels kissing me good night as they headed off to bed. Those muffins look delicous – perfect for school lunch boxes. That’s a nice way to wake up… and yes, good for lunch boxes. Monkey Boy has one today. They do get that bit more good looking don’t they Heidi…I wonder why that is so. It’s amazing what clean windows will reveal. 5 minutes isn’t long enough… that’s just teasing torture! They are good ones aren’t they. Keep well, good warm, good cold, and easy peasy. I love clean windows. Even more so when someone else cleans them. And I love a good muffin too. Clean windows are so much more enjoyable when someone else does them. Mr Chocolate deserves chocolate apple oat muffins for that! lol that makes me laugh. I’ve never had a sneaky nap, napping at all is rarely within my capabilities, but when I do try to ‘nap’ it turns into a 3 or 4 hour sleep! I have bookmarked this recipe yum! Lovely! I’ve never made apple and oat muffins before, why? Hmm, I need to try these. Clean windows can change ones day!! 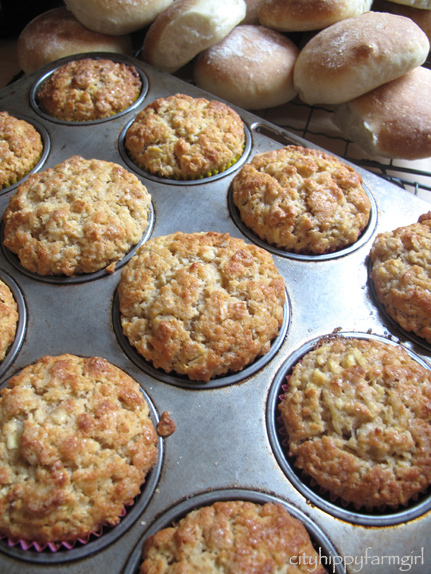 That topped with the smell of those muffins… Must have been a good one! Yummy looking muffins there, and I am very impressed with Mr Chocolate, I’m forwarding this post to Mr Good, let’s see if he takes the hint. I almost had one of those sneaky sleeps teaching year 10s last period today, not sure that would have been a wise move! The man about the house cleaned our windows earlier this spring. I love him buckets for it and is amazing how much better you can see out of clean windows! clean windows, glorious golden afternoon light, and cake – all inspiring me to action. Those are really pretty muffins! ohhh, I do love those kind of naps where you feel suspended between worlds upon waking. The muffins look great too. The muffins look perfect Brydie. That was of course after I gave my screen a wipe over. Hehe. I just made some banana oat muffins that turned out very dry. I am going to try yours because they look so darned yummy. Awesome Woos! Really glad you liked them, and thanks for letting me know hoe they turned out. Happy baking!